Lupodesmoquattro Nice driving groove,perfect guitar and synthesizer . 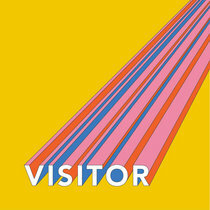 Favorite track: Voodoo Chases The Muse. Special Limited Edition of 500 CDs. Includes unlimited streaming of Swamp Of Dreams via the free Bandcamp app, plus high-quality download in MP3, FLAC and more. 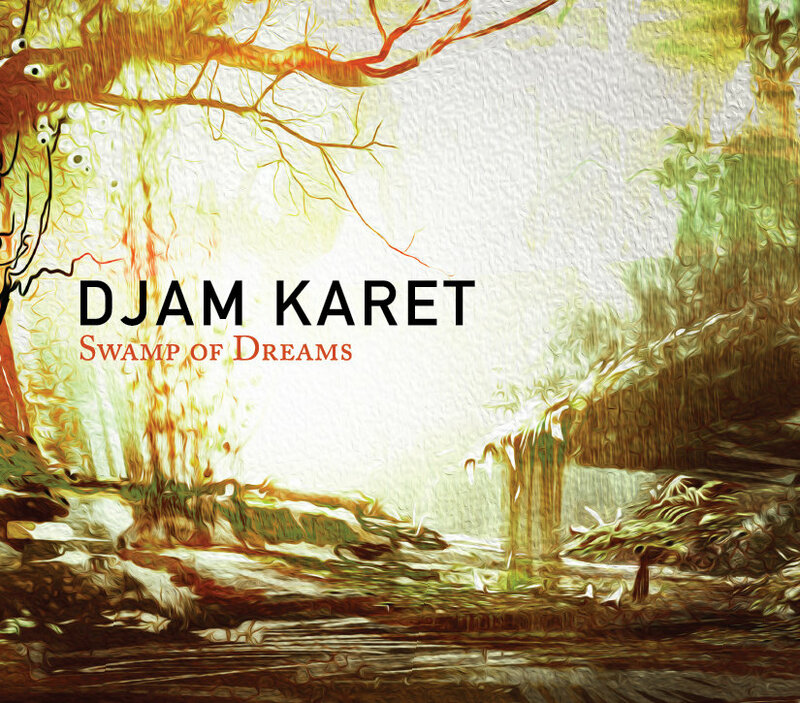 The music on Djam Karet's new CD "Swamp of Dreams" is a collection of older tunes that were originally only available as individuals tracks on different compilation CDs and fund-raiser albums, released between 1990 and 2006. These compilations and fund-raiser albums include: Holland's IO Pages Magazine's "A Decade Of Prog" CD, and a Hurricane Katrina/Habitat For Humanity fund-raiser called "After The Storm", among others. 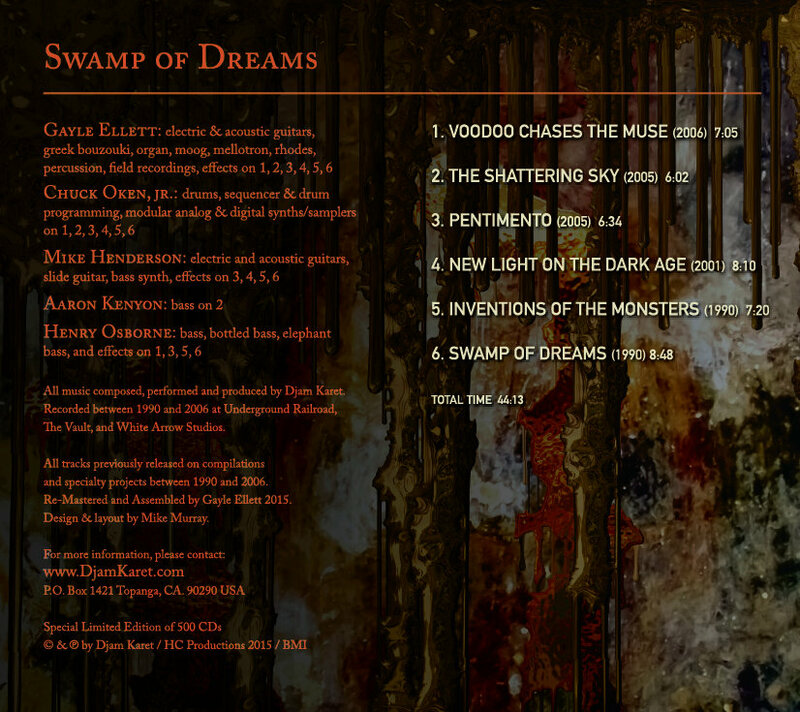 And now with "Swamp of Dreams" we are making this long-lost music available again, this time to a wider audience. 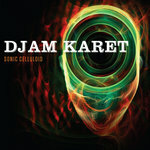 All of the music has been re-mastered with an increased dynamic range, and greater clarity and punch, while still retaining all that is good about the music of Djam Karet. 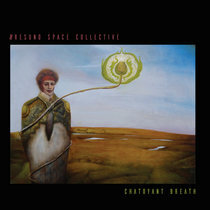 "Pink Floydian dreamscapes intersect with the jagged complexity of King Crimson and the improv-guitar happenstance of the Grateful Dead"
"Hose down your living room, or your furniture will be burned to a cinder by the intense guitar playing of Gayle Ellett and Mike Henderson"
"The greatest undiscovered band in the world! Rivals the glory days of Pink Floyd"
"The most important band of the last decade"
"One of the best damn ROCK bands on the planet"
"One of the best bands in the genre"
"One of the most satisfying and imaginative recordings to emerge from the ambient genre in the past decade"
"Some of the most exciting and intense progressive music of the last 20 years"
"The ultimate Jam band...just a little ahead of its time"
"Guitars crunch, slash, crash and bang through a bundle of hard driving prog rock cookers. 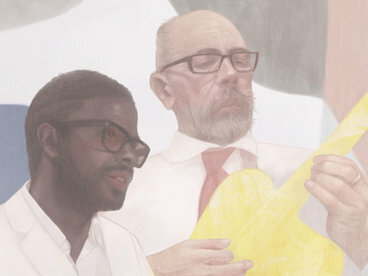 Think 1973 and King Crimson"
"The writing, arranging and performances are of the highest order. 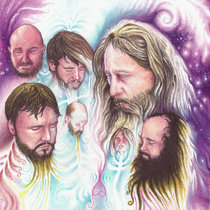 Highly Recomended"
"The near telepathic chemistry displayed by these four musicians was dead-on, and they proved themselves masters of their chosen instruments. 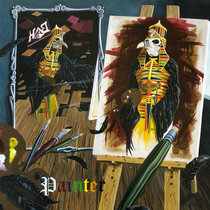 This is one of the major releases of the year"
"They can burn the paint right off your walls"
"If you yearn for top-drawer, metal tinged prog chockful of classic synth textures, spacey yet incendiary dual guitars, and tight drum and bass grooves - this tasteful and well produced CD is for you"
"They will dazzle you with breathtaking instrumental performances"
"Djam Karet seems to be a benchmark that bands of this ilk are measured against"
"One of the finest bands in the progressive rock business. Highlights abound throughout, the band's rich legacy continues to unfold with each subsequent release"
"These guys never cease to amaze or entertain me"
"Emerson, Lake and Palmer never really grooved as wel as Djam Karet do"
"Unearthly voices speak to each other, as strange animal sounds provide a counterpoint to the chiming melody"
"They hit the bullseye again with yet another progressive masterpiece"
"A must have for any lover of good musicianship"
"Their music has a sweeping, epic sound very much in the classic tradition." 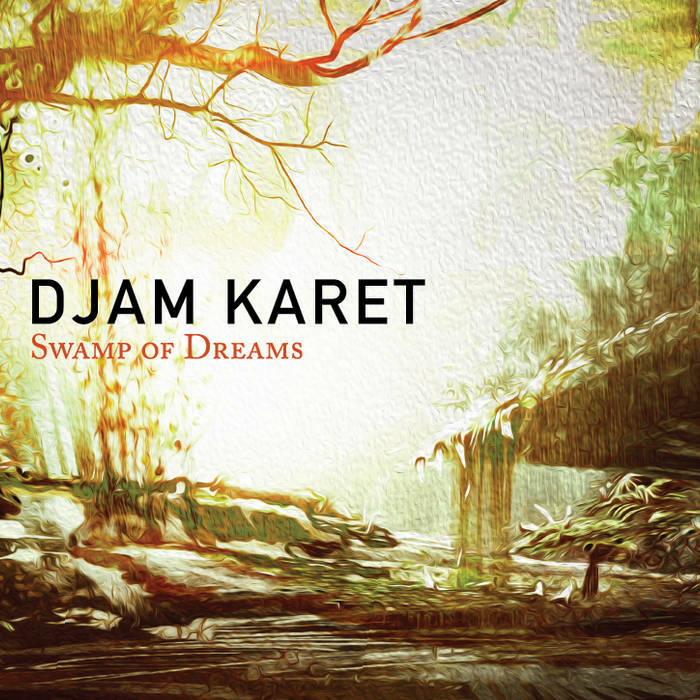 "Progressive" in the purest sense of the term"
"The music of Djam Karet is still innovating and the universe called Djam Karet is still expanding. 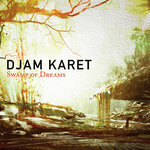 It's always a pleasure to review their music"
"Djam Karet is a highly sophisticated outfit and their music crosses many boundaries and they do it with ease. 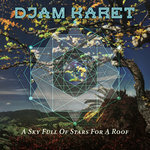 They are the best instrumental band in America"
"Djam Karet have done a masterful job of moving their trademarked sound in yet another developmental direction. 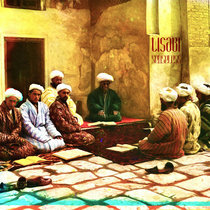 Their sound is easily identifiable being a mixture of psychedelic, symphonic, industrial and ambient. 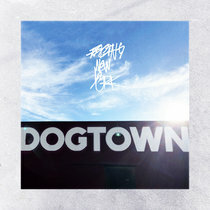 Highly recommended"
"A band with more than 20 years of existence shouldn't need any introductions. 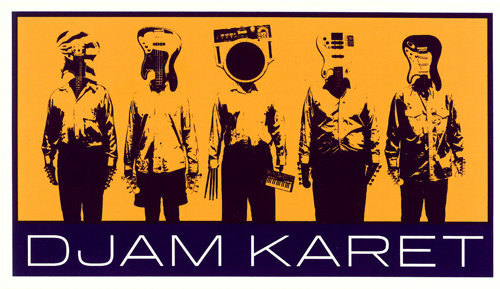 Their 15 studio recordings talk for themselves and those who are very much into instrumental progressive music surely already have listened to music from this band"
"This is real barnstormer with a fluid and spacy sound perfectly balanced against a fusiony, raging guitar attack"
"The new release by Djam Karet features tightly performed and well thought out pieces that derive from the classics"
"Djam Karet continues on with the band’s tradition of producing some of the best instrumental progressive rock ever written. 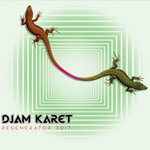 On Recollection Harvest, Djam Karet shows that they do what most bands of the genre don’t, they’re still progressing, creating adventurous instrumental progressive rock music. They simply do not rest on their past laurels. What other band can honestly say that? 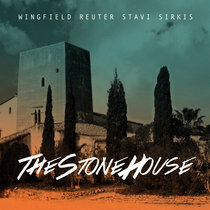 That being said, I give this album a high recommendation"
"If you're looking for modern guitar soundscapes to carry on the traditions of "Meddle" or "Lark's Tongues In Aspic", check this disc out"